You are at:Home»News»Sarawak»Has the media misquoted Masing? Has the media misquoted Masing? The Borneo Post stands by its story with an audio recording from the dinner to let discerning readers have their say. KUCHING: The recent proposal by Deputy Chief Minister Tan Sri Dr James Masing to use Sarawak’s RM31 billion reserves on local development projects before the next state election due in three years’ time has ended up drawing flak and scorn from the public and both sides of the local political divide. If you’re new to the recent development, here are clippings of various local newspapers that reported Masing’s proposal during a speech he gave at a dinner on Sunday in which he was the guest of honour. In response to the public outcry, Masing later alleged that the local media has misquoted him on the matter and that he did not propose that we should use “all of the reserve” but rather “part of the reserve”. To back up his claims, he produced his text of speech, which was not distributed to reporters. While the text of speech clearly states that only “some of the reserve” is suggested to be used, recordings of his actual speech show that Masing’s speech had deviated slightly from his text-of-speech. Here is a video showing part of Masing’s actual speech with text inserted. From the video, it is clear that Masing was not reading his speech verbatim, which is understandable as no good speech is given verbatim. But it leaves room for error and also misinterpretation, especially when no additional material is provided to the local media. In saying that, however, The Borneo Post acknowledges that there was a change in our original preview blurb for our Facebook post of the article in question. Originally our initial preview blurb read ‘Should Sarawak use up all its state reserves before the next general election?’. It was a question with no attribution to Masing. However, when the news broke and subsequent public backlash ensued, we realised that many of our commenters were interpreting our preview blurb as a direct quote from Masing. Not wanting the misinterpretation to continue, we later changed our preview blurb to the current ‘Should Sarawak use its RM31b reserves for developments before the next state election’. 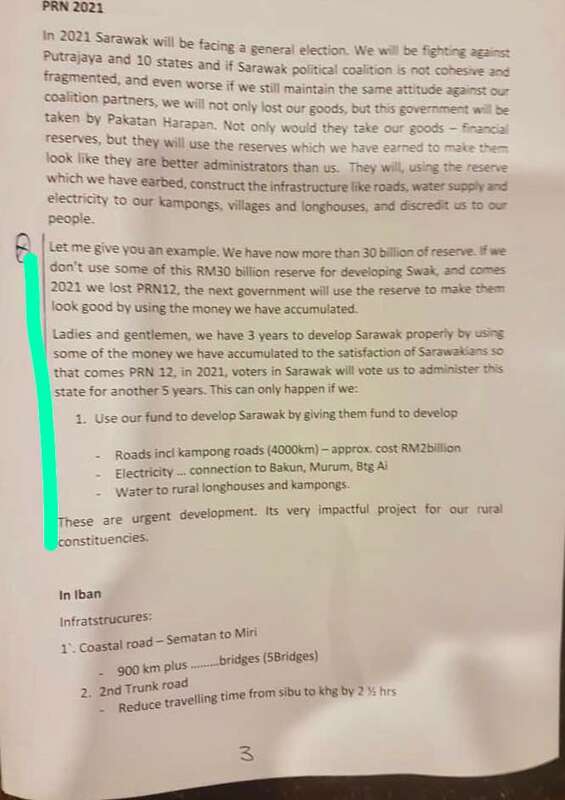 We apologise for the confusion on this matter and would like to make it clear that our initial preview blurb on Facebook was not a direct quote from Masing and that our article’s headline has always read ‘Masing suggests Sarawak’s reserves of RM31 billion be used before the next state election’. In any case, The Borneo Post stands by its reporting of the speech and leaves it to the public to decide on whether we and other local media outlets misquoted Masing. Regardless of your opinion on the situation, let us remember that the RM31 billion is rightfully Sarawak’s reserves and as long as it is used for the betterment of Sarawak and our people with careful budgeting and transparency, it is money well spent. “In 2021 Sarawak will be facing a election. We will be fighting against Putrajaya and 10 states and if Sarawak political situation is not cohesive and fragmented and, even worse, if we still maintain the same attitude against our coalition partners, we will not only lose our goods but this government will be taken over by Pakatan Harapan. “Not only they will take our goods, financial reserves, but they will use the reserves which we have earned to make them look they are the better administrators than us. They will be using the reserves which we have earned to construct the infrastructures like roads, water supply and electricity (supply) to our kampungs, villages and longhouses and discredit us along the way. “Let me give you an example. Ladies and Gentlemen. We have about RM31 billion of state reserve. If not used, this RM31 billion reserve for developing Sarawak, come 2021, we may lose; we may lose the PRN12. “The next government who take over from us, will use that reserve and build infrastructures, build roads and water supply to rural areas to make themselves look better than us. In fact, that should not be because we are the one who earned the money and they just use it to make themselves look better.